I’ve been doing jewelry box makeovers for over 7 years now and there’s no end in sight! My goal? Save every old jewelry box and jewelry cabinet from the landfill. And I know many of you are joining me in my quest. I know that because many of you ask advice on finishes and where to buy jewelry box hinges and other hardware. So today, I’m sharing where I buy mine locally and some great online resources, also. D. Lawless Hardware provided me with free samples to show you on the video below. They’re also sponsoring this month’s Upcycle Sharin’ Challenge. So if you want to participate, scroll down for the details. Another local store, Beverly’s, has some, too, but I don’t think they’re a national chain. Also, whenever I replace any old hardware on a jewelry cabinet with new, I save the old hardware to reuse on future DIY projects. Y’all know I love shopping on Amazon. 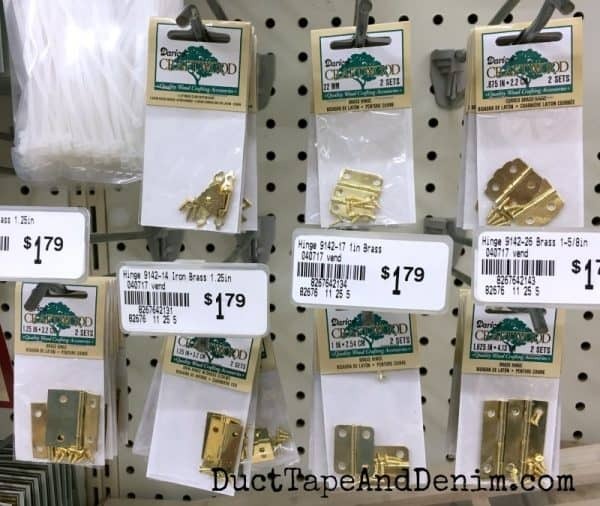 They don’t have a huge selection but I did find a few of the Darice hinges and tiny screws shown in the photo above there. I saved the best for last! The absolute BEST place online that I found to get jewelry box hardware is D. Lawless Hardware. 1) Join our Upcycle Sharin’ Group on Facebook where you can get updates to this challenge as well as finding an upcycle tribe. 2) Scroll to the bottom of this post and click add link. From there you can add your upcycle project that will feature this month’s theme – HARDWARE. It must include some form of hardware to be eligible. Note: You don’t need to have a blog to enter your project. 3) You have until February 15th to add your project. After that, voting begins. You can vote 3 times. 4) The person with the most votes wins and will be announced on March 1st. 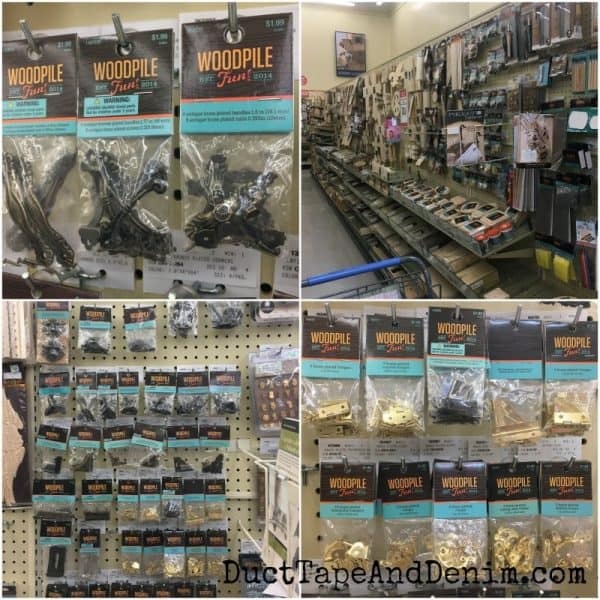 D. Lawless Hardware is providing a gift card for this month’s prize. Leave a comment if you have any more questions about jewelry box hinges or makeovers! Originally published August 29, 2017. Thanks you very much for the recommendation! Just now saw this, made my day! I’ll share around soon! lol… sorry, I thought I had shared it with you. I’m easily distracted! Thanks for the great info and sharing your amazing jewelry boxes! Can you suggest somewhere to purchase plastic chain/necklace carousels? I am probably not looking in the right place, but do you show how to replace the lining in the drawers of jewelry boxes? Some of the boxes I see at thrift stores are quite stinky. Thank you! Hi, Cinda, I haven’t done a video on replacing the lining yet. I’ve painted over the fabric, decoupaged paper or fabric over it, or pulled out the lining and decoupaged, also. Different every time! Just started following you, thanks for sharing your talents. Do you have information about paints and finishes too? Thanks. Yes! I have LOTS of info about thrift store makeovers. You can search my blog or sign up for my newsletter. You may want to start here: https://ducttapeanddenim.com/diy-jewelry-box-makeovers/ Let me know if there’s anything specific you want to know… maybe I can direct you to the information you need.